People complain that a bunch of DVD decrypters in current market are not worth a farthing when it comes to dealing with commercial, with problems like half-crash, pop-up Window "It's sorry to tell you…." or promotion message to guide you to purchase their paid-for product. They almost has no extravagant hopes in finding a trust-worthy protected DVD ripperripper. Here is the silver lining. You can try the world-famous DVDFab HD Decrypter. Under the recommendation of DVD lovers and tech editors, the free DVD decrypter does work with many copy protected DVDs, though sometimes it occasionally fails. How much do you know about this free decrypting software? Here we go! MacX DVD Ripper Mac Free Edition - Powerful DVD decrypter and ripper to remove al the new DVD copyright protections, copy DVD to hard drive and rip DVD to digital format/device with intact quality. Step 1: Download and run DVDFab HD Decrypter. Choose Copy option on the left panel, say, Full Disc and Main Movie. Step 2: Insert the DVD disc by clicking on the Add button. For the full disc mode, you can preview it; for the main movie mode, you can preview title, change chapters and set subtitles. Step 3: Hit Start button to run the DVD copying process. Which is the best program works like DVDFab HD Decrypter? Note: DVDFab HD Decrypter is the free version of DVDFab DVD Copy, but with limited functions, according to DVDFab official site. It has beem discountined and DVDFab HD Decrypter fulfils its responsibilities limited with the old DVDs with the simple DVD protection tech. For the new movies on DVD, the freeware cannot handle. If you confront with the troubles, I advise you to have a try on the best free ripper similar to DVDFab HD Decrypter - MacX DVD Ripper Mac Free Edition since I am the beneficiary of this solid yet free DVD ripper. What makes this DVD decrypter freeware so special? Read on and you will know it. 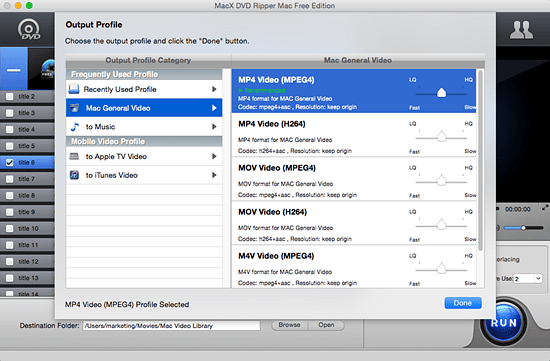 MacX DVD Ripper Mac Free Edition compensates for what DVDFab ripper freeware can't do. See, DVDFab free decrypter is a great product to copy just any old DVDs with either full disc or main movie for totally free on Mac. But it lacks the core technologies to remove the latest DVD encryption tech. The DVDFab for Mac alternative is constantly upgraded to disable the latest copy protections in commercial DVDs, no matter the CSS, Region Code, UOPs, RCE, or Sony ARccOS, Disney Fake and convert DVD to MP4, MOV, M4V, MP3, etc. for playback on iPhone X/8/7/6S/6S Plus/6 Plus/5S/C, iPad mini 4/Air 2, iPad Pro, Apple TV 4, iTunes, iMovie, Galaxy Note 8/S9, HTC, Sony, Microsoft and more. And assisted by hardware acceleration, hyper-threading tech and multi-core CPU use, this high-end tool promises you a no more than 30-min process to decrypt and copy a DVD movie. And the output DVD movie quality is also guaranteed with zero loss thanks to its inherent High Quality Engine supports. How to Decrypt Protected DVDs with the Free DVDFab HD Decrypter Alternative? After free download this Mac free alternative to DVDFab HD Decrypter on your computer, load the DVD you want to backup by clicking "DVD Disc" or "DVD Path" button. Step 2: Select Output Format or Device. Choose "Mac General Video" from the output profile and opt for the video format you need, like MP4, MOV, M4V or music format MP3, AAC, AC3, etc. Step 3: Set an Output Folder. Step 4: Start DVD Decryption and Backup. After finish the above steps, click the "RUN" button to start sweep away DVD decryption tech and make copies of DVD, you could view the conversion progress and are able to cancel the converting process at anytime. If you need to transfer DVD to iPhone iPad iPod iOS device, no bother with iTunes' complicated sync. You can rely on MacX MediaTrans. This iPhone manager realizes two-way sync that iTunes cannot manage to do, which can easily backup iPhone photos to free up space and transfer video/music to/from Mac computer to iPhone iPad within a few clicks. This above tutorial indicates how to decrypt and convert DVD to iPhone iPad Android supported videos with top free DVDFab HD Decrypter alternative, then how to 1:1 lossless clone DVD to ISO image or backup DVDs with main/full title, please get reference here. DVDFab won't work on Mac OS X, so if you need to rip DVD to Mac MP4 MOV AVI WMV MKV or so, you will need an equivalent app to DVDFab to remove copyright protection and copy DVDs on Mac.